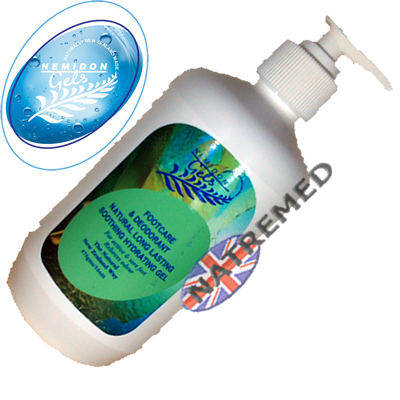 Nemidon Footcare and Deodorant Moisturiser is a long lasting moisturiser for dry cracked skin on feet. It contains natural plant extracts and essential oils of Lemongrass, Lavender, Tea tree and Rosemary. This rapidly hydrating gel promotes elasticity of the skin, relieves foot odour, cools and soothes tired aching feet and legs. Non-greasy and fresh smelling, your feet will feel soft and fresh. 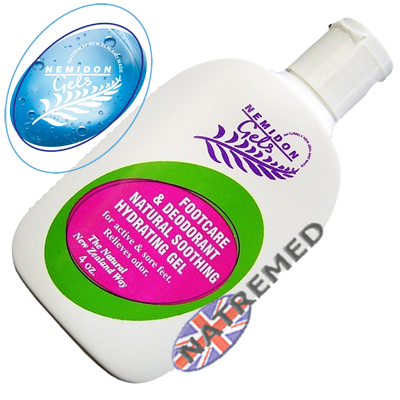 Use Nemidon Gels to protect and prevent dry skin conditions. Diabetes Associations stress how important it is to keep skin moisturized, dry and clean. Rather a contradiction in words, yet Nemidon Ultra-hydration Gel and Footcare Deodorant do perform all these tasks in one. These Nemidon products will moisturise quickly, leaving a clean dry skin. Both Gels assist to prevent infection by maintaining skin integrity, plus Footcare Deodorant Gel has the added advantage of Tea tree and Lavender, essential oils which assist mild bacterial and fungal infections. Nemidon hydrating gels do not need to be applied after bathing or showering to improve the ability to hold water onto the skin as a traditional barrier treatment may do. Nor is a greasy residue left. They work fast and are long lasting.